The mainstream media has tipped so far to the left that it appears they are no longer capable of just reporting the news without twisting, distorting or lying about the truth. The have replaced the basic principles of journalism with the notion that they are a political propaganda machine, thus losing all integrity with anyone who is capable of discerning what’s really happening in the nation. 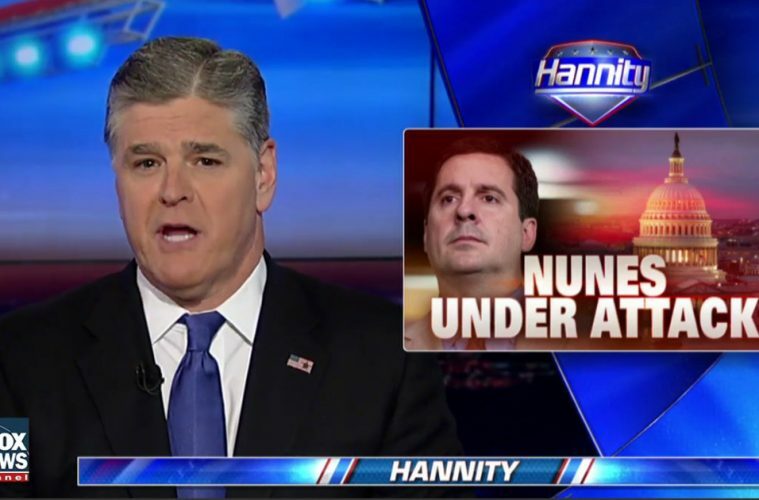 Thus, as charged by Hannity, the media is intentionally trying to mislead the American people by attacking Nunes over doing what he was supposed to do. Fox News’ Sean Hannity on Friday came to the defense of the House intelligence chairman who has come under fire for saying he read reports that President Trump and his team were under surveillance. Republican Rep. Devin Nunes, chairman of the House Intelligence Committee, is facing criticism for going to Trump after a secret intelligence briefing before reporting his findings to his committee. Nunes, who was a member of the presidential transition team, has resisted calls to step aside from his committee’s investigation into contacts between Trump campaign officials and Russians. Hannity said the media is attempting to ignore the facts and are distracting the country by going after Nunes.